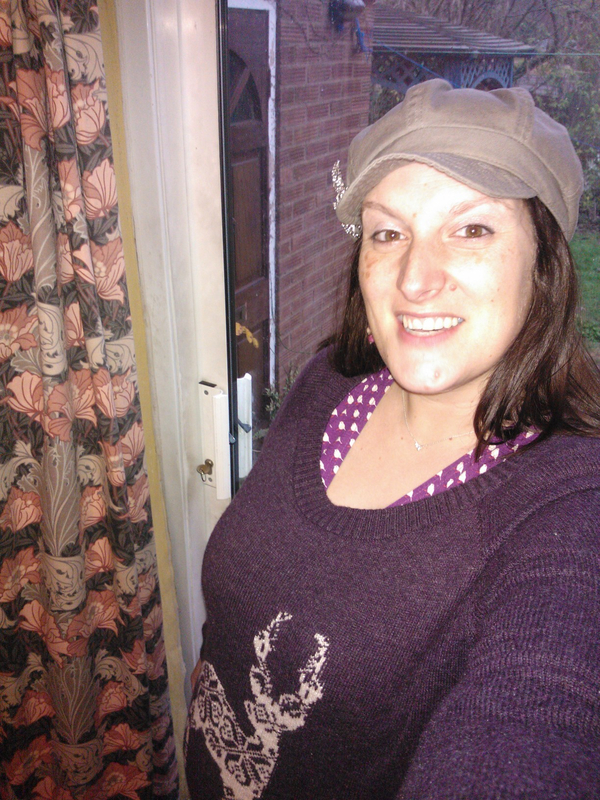 My treat – a Christmas jumper! This is also Bump’s first photo! It seems like a daft thing to have to get used to resting, but after the crazy-exciting roller-coaster that has been the last five years of my life, I’ve become accustomed to being busy. Very busy. I’ve generally been writing the first draft of my next book as I’m promoting my most recent novel and that takes me over Christmas, ready to begin editing from January onwards. This year, after my decision to start again with my fifth novel, Take A Look At Me Now, and having to write the new version in just over a month, I decided to complete the first draft of Book 6 by the end of November so that I could take December off. I needed a break – and also, with a certain Bump on board, I wanted to have some time to enjoy the thrill of expecting a baby. I’ve always written. I wrote in the evenings after my day job and at weekends. I wrote in lunch-breaks and on train journeys. I even once wrote in a cinema during a particularly boring film (and was amazed that most of my notes were legible!) Having a ‘real job’ meant I worked writing around everything else and it’s a habit I’ve relied upon since becoming a published author. But in September this year I was finally able to give up the day job and become a full-time writer. Which was amazing – and a complete ambition fulfilled. Suddenly my head had space to think and I could write at any time of day (or night, which is usually when my brain kicks into gear) and know I didn’t have an annoying alarm at 6am every day to drag me to work. Writing the first draft of Book 6 was a whole new experience because for the first time ever I was able to concentrate on one project, without a frustrating to-do list dangling like a Damoclean sword above my head. I handed it in and suddenly had a whole December to not think about it. I never expected resting and not writing to be a challenge. But it has been. My brain, freed from the concerns of a day job, is like an overexcited kid in a fancy dress shop: Look! We could do this! Or This! Or THIS! – as feathers and sequins and cowboy hats and dragon tails are flung into the air. Instead of thanking me for the chance to not think of stories, my brain was adamant that this was the perfect opportunity to write anything and everything I could. December is my dreaming month. I’m not embarking on any big writing projects and I am resting (fully immersed in awful Christmas movies, twinkling fairy lights and festive tinsel), but I’m allowing my brain to dream. So, if a new sparkly idea happens to pop into my writer brain, I’m giving it space to bop around for a while. There’s no pressure to write it, or see it as a possible publishable object: I’m just enjoying the thrill of entertaining ideas. I’m not stressing over them and they may come to nothing, but I like that they feel free to arrive. And the loveliest thing? It’s reconnecting me to that initial surge of adrenalin and creativity that made me fall in love with writing in the first place. That made me dream of, one day, writing books that would be read around the world and maybe, just maybe, being able to make a living from my stories. It’s too easy to forget – and I have forgotten over the last five years – what a gift it is to be doing what I’m doing now. Allowing myself time to dream has transformed the way I look at my writing and I’m confident that my future work will only benefit from it. I would advise any writer – published or waiting-to-be-published – to allow yourself Dreaming Time. I think you’ll be amazed at how productive and enjoyable it will be! This entry was posted in Writing and tagged advice, author, books, Christmas, December, dreaming, Miranda Dickinson, resting, writing. Bookmark the permalink. I know – only 13 weeks to go now..
A great blog post, Miranda. Have a lovely dreamy December and a very Happy Christmas!